Instrumental jazz renderings of music by composer Charlie Smalls from the Tony-winning musical The Wiz. With the completion of two new CDs set for release in January 2005, The Onus has four recordings to its credit: its self-titled, independently released 1997 debut; 2000's Reoccurring Dream (the first CD released on the HiPNOTIC label); Y'All Got It (2005) (see CD description below); and Triphony (2005), which features the trio of Harper, bassist Matthew Parrish, and drummer Butch Reed. The Onus features New York-based guitarist Jeff Ray, a classmate of Harper's at Rutgers who, like Harper, studied with Kenny Barron, among others. Based in Philadelphia, bassist Parrish (also a Rutgers jazz alum) and drummer Reed also are original members of the ensemble, and set the pace on all of the band's recordings to date. Harry Appelman presently fills the piano/organ chair previously occupied by Jason Shattil and Kyle Koehler. Parrish (with Circles) and Ray (with The Walkup) made their recording debuts as leaders in 2002 and 2003, respectively, and remain active in both leader and sidemen roles outside of their work with The Onus. Appelman and Reed are among the most in-demand players on the Washington, DC and Philadelphia jazz scenes, respectively. 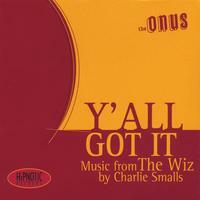 Y'All Got It pays loving tribute to the late composer Charlie Smalls whose brainchild, the 1975 Tony Award-winning musical The Wiz, left an indelible mark on Harper when he saw the original Broadway production as child. The recording features the entire quintet, with Appelman alternating between piano and B3 organ. Although organ has been incorporated (with and without bass) in the band's live performances since 1998, Y'All Got It is The Onus's first recording to feature that instrument and the B3 brings a warmth and energy to the music that are appropriate to the soulful, Gospel-informed material. The CD presents Harper's sympathetic arrangement of eight tunes from The Wiz and a Smalls-inspired ballad by noted jazz composer and educator Andy Jaffe. The arrangements showcase the beauty of the familiar melodies against the backdrop of swing, Brazilian "bossa," Indian "mora," and Congolese-infuenced New Orleans rhythms. In this way, the album succeeds in both nurturing nostalgia for the musical and re-introducing Smalls's compositions as viable and interesting vehicles for jazz improvisation. The musicians take turns introducing the tunes and rendering the melodies, in addition to delivering masterful solos, interactive accompaniment, and spirited group improvisation. Fans of the musical and fans of "the music" will be equally satisfied with the results!